I had a big purchase some weeks ago and the products were delivered in a big cardboard box. Whenever there is a cardboard box, it won’t take much time and Shyna will be on the scene. But I think all cats like cardboard boxes. 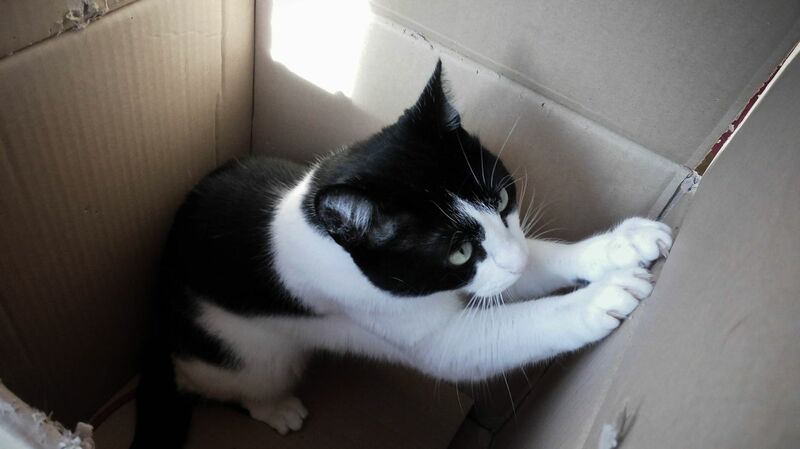 I formed a habit to leave new cardboard boxes to my cat for a while because it serves some purposes at once,… she can scratch on it, she can relax in it, she can play with it, she can hide in it and so on. I think they really love it. Not sure if I ever heard about a cat that doesn’t like a cardboard box. It must be a lot of fun for them. [ Smiles ] Shyna looks as though she is having fun in that cardboard box. By the way, Dennis. That is a lovely picture of a cute cat! Yes, cats do love cardboard boxes, and anything else they can get into or hide under. If you can remember playing with big cardboard boxes as a child perhaps the attraction is easier to understand. Loved this post. I’m from Jerusalem, and glad to meet you.